Not to be confused with Valencia Metro (Venezuela). Metrovalencia[a] is a modern amalgamation of former FEVE narrow gauge diesel and electric operated suburban/regional railways. It is a large suburban network that crosses the city of Valencia, with all trains continuing out to the suburbs. It also has destinations on lines that make it more closely resemble commuter trains. The unique system combines light railway, metro and several tram operations north of the Túria riverbed park with line 4. Trains of lines 1, 3, 5 and 9 have automatic train operation (ATO) in 25.3 kilometers of underground system. Tram lines 4, 6 and 8 are operated by modern trams. This network consists of more than 156.4 kilometres (97.2 mi) of route, of which 27.3 kilometres (17.0 mi) is underground. The system authority Ferrocarrils de la Generalitat Valenciana (FGV) uses bilingual signage in Valencian and Spanish. † Notes: In 1998, Line 2 was combined with Line 1; it became a separate branch again in 2015. Lines 7 to 9 were created in 2015 by splitting existing branch lines, with the only new stations for these lines consisting of the extension from Manises to Riba-roja de Túria. The network includes five unmanned stations: Rocafort, Fuente del Jarro, Massarojos, Benaguasil 1 and Font de l´Almaguer. In 2012, an estimated 63,103,814 passengers used the service, a decline of 2.8% from the 65,074,726 who had used it in 2011. The 2011 figures had shown a 5% decline compared to 2010. On average 172,887 passengers a day used the service in 2012 with the busiest day being 18 March, the final day of the Fallas festival, when 482,960 passengers used the service. The three most used stations on the network were all in the centre of Valencia: Xàtiva, beside Valencia's main train station, with 4,769,628 passengers in 2012, Colón, in one of Valencia's main shopping streets, with 4,189,736 passengers and Àngel Guimerà, an interchange station for lines 1,4 and 5 situated beside Valencia old town, with 2,461,012 users. The fourth and fifth busiest stations were Túria, next to Valencia's main bus station, with 2,035,521 and Facultats, serving the University of Valencia, with 1,951,080 users. The remaining stations in the top eight were Plaça de Espanya (1,807,538 passengers), Amistat (1,552,281) and Mislata (1,505,106). The first two of these were located in areas near Valencia centre, while Mislata was the main station for the satellite town of the same name. In 2014, the system carried 60,111,000 passengers. In 2015, 60,686,589 passengers used the network, reversing a decline which had occurred in previous years. The 10 busiest stations were Xàtiva (4.4 million users), Colón (3.9) million, Àngel Guimerà (2.4 million), Túria (1.9 million) Facultats (1.8 million), Plaça d'Espanya (1.7 million), Mislata (1.5 million), Torrent Avinguda (1.4 million), Amistat-Casa de Salud (1.4 million) and Benimaclet (1.4 million.) 7 other stations (Marítim-Serrería, Avinguda del Cid, Nou d`Octubre, Patraix, Ayora, Joaquín Sorolla-Jesús and Paiporta) had more than 1 million users. Many stations have an artistic exhibit in the entrance hall. This one is in Benimaclet. On 8 October 1988 the tunnel through which line 1 crosses Valencia was opened between Sant Isidre and Ademuz (now Empalme), which connected the line with southbound trains from València-Jesús to Castelló de la Ribera (now Villanueva de Castellón) at Sant Isidre. Line 2 went from València-Sud to Llíria, with some trains terminating in Paterna. In May 1994 the tranvia line 4 opened. Valencia was the first city in Spain to use this mode of transport in the modern era. Originally, line 4 was 9.7 kilometres (6.0 mi) long and had 21 stations. The line connected the suburban lines with high demand zones such as the Polytechnic University, the new university campus and the Malvarosa beach, which the former line Empalme - Pont de Fusta - El Grau had connected before. One year later, in May 1995, line 3 was extended from El Palmaret in Alboraria to Alameda. The extension reused the older railway line Pont de Fusta-Rafelbunyol, of which part was scrapped (between Pont de Fusta - Sant Llorenç - El Palmaret), and the rest was switched from 750 V to 1500 V.
Further alterations followed five years later. On 16 September 1998, line 2 was merged with line 1, and Line 3 was extended from Alameda to Avinguda del Cid in the west and Torrent in the south with some trains only going as far as Jesús. Half a year later, on 20 May 1999, line 3 was extended from Avinguda del Cid to Mislata-Almassil. In April 2003, the new line 5 was opened. This line took over the previous line 3 connection from Alameda to Torrent, together with a newly constructed branch from Alameda to Ayora 2.3 kilometres (1.4 mi). (Although some very early morning trains still travel from Machado to Torrent, this is not represented on maps.) One year later, the new line 5 was extended, together with line 1, from Torrent to Torrent Avinguda, a distance of 2.3 kilometres (1.4 mi). On 3 October 2005, Bailén station was opened on line 5. This station is between Colón and Jesús, and has connections with València-Nord, the main railway station of València. Furthermore, Bailen is close to the Plaça d'Espanya station on line 1. In October 2005, line 4 was extended to Mas del Rosari, and on 20 December 2005 to Lloma Llarga-Terramelar. 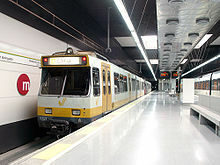 On 2 April 2007, Line 5 was extended to the East to a new station Marítim-Serrería (originally planned as Jerónimo Monsoriu). On 18 April 2007, Line 5 extended to the airport (Aeroport Station) in the west and to the Port (Marina Real Juan Carlos 1 Station, originally called Neptú station) in the east, this last section from Marítim-Serreria to Marina Real Juan Carlos 1 is a tram section; the trains go from Aeroport to Marítim-Serrreria and then a tram operates between Marítim-Serreria and Marina Real Juan Carlos 1; the tram is now denoted as Line 8. Line 3 was extended to the Airport as well to cover the schedule limitations of line 5 to Aeroport station. On 22 September 2007, Line 6 was opened, linking the neighbourhoods of Orriols and Torrefiel to the metro system for the first time. Additionally a new station "Torre del Virrei" was added to Line 1. It is situated between the stations of "L'Eliana" and "La Pobla de Vallbona". On 12 December 2010, the two overground line 4 stations in the municipality of Alboraya, Alboraya and Palmaret, were replaced by the subterranean stations of Alboraya - Peris Aragó and Alboraya - Palmaret. On Line 1, the station of Jesus was renamed Joaquin Sorolla, while the Hospital station was renamed Safranar. On 6 March 2015, a 4-station extension to Riba-roja de Túria was opened. This followed the path of a regional train line, which had been closed in 2005. In April 2015, the metro map was redrawn, with several of the branches split into separate lines, increasing the number of lines to 9. Between 2002 and the first quarter of 2012, 83 accidents had occurred on the network, costing the lives of 56 people. On 9 September 2005, two trains crashed into each other on Line 1. Nobody was killed, but according to early reports 35 people were injured, 4 of whom were taken to hospital, their condition described as serious. The first train had been stationary waiting for a red signal. The second used its emergency brakes to avoid a collision, but was hit by a third train. The force of the impact severely damaged the drivers' cabs at the front of the last train and at the rear of the second train. The crash occurred between Paiporta and Picanya about 5 km south-east of the city centre. The 3729 and 3730 EMUs are now a single EMU with 3729A and the 3730A cars, the 'B' cars were severely damaged and are currently at València-Sud workshop, waiting to be scrapped. The date 3 July 2006 was a dark day for the Valencia metro. In a severe accident, a two-car EMU derailed between Jesús and Plaça d'Espanya stations. At least 43 people were killed and 47 injured. It was the worst metro accident in Spanish history. Three more lines are planned to be opened in upcoming years. The Tavernes Blanques - Natzaret metro line is under construction and partially completed, work was halted in 2011 due to the Spanish economic crisis and resumed in 2017. Tavernes Blanques (South) - Natzaret Underground + tramway Under construction. Natzaret to Xàtiva section to be completed by 2023. Faitanar/Bonaire - La Fe/Silla Underground + tramway Project. Port Saplaya - Marítim Serrería Tramway Project. ^ a b c d e f "FGV en cifras > Metrovalencia en cifras > Datos de la red de Metrovalencia" [FGV figures > Metrovalencia figures > Data on the Metrovalencia network] (in Spanish). FGV. 2014. ^ a b "Metrovalencia alcanza los 62,6 millones de viajeros en 2016, un 3,2% más". La Vanguardia (in Spanish). EFE. 14 January 2017. Retrieved 14 January 2017. ^ "El metro de Valencia pone en marcha el sistema de conducción automático" (in Spanish). Retrieved 14 May 2014. ^ "Conversion Of Railway Lines For Suburban Passenger Services" (pdf). The World Bank. Retrieved 7 May 2011. ^ FGV prevé el cierre de líneas y la venta de estaciones para ahorrar 29,3 millones (in Spanish), Levante, 3 January 2013. ^ Metrovalencia desplazó 63'1 millones de pasajeros en 2012, un 3% menos (in Spanish), ABC, 6 January 2013. ^ "Estadística de Transporte de Viajeros" [Passenger Transport Statistics]. Ine.es (in Spanish). Instituto Nacional de Estadística [National Statistics Institute]. Archived from the original on 26 September 2015. Retrieved 30 November 2015. ^ La línea de metro a Ribarroja entrará en servicio el 6 de marzo (in Spanish), Las Provincias, 2 March 2015. ^ Así serán las nuevas líneas de Metrovalencia (in Spanish), ABC, 27 November 2014. ^ La red de Metrovalencia ha sufrido 83 accidentes con 56 fallecidos desde 2002 (in Spanish), El Pais, 5 June 2013. ^ Zafra, Ignacio (12 June 2017). "La Generalitat reactiva las obras de la línea de metro T2 de Valencia, paralizadas desde 2011" [The Generalitat reactivates work on Valencia's T2 metro line, paralised since 2011]. El País (in Spanish). Spain. Retrieved 18 June 2017.